Jesmond Zerafa was officially presented as the new Valletta coach today, and he immediately declared his intention to take the league title back to the City. Zerafa led Qormi to a top six finish at the last season but resigned a few weeks ago. Valletta president Victor Sciriha also presented former Valletta and Malta player Leonard Farrugia as assistant coach and said that Jesmond Zammit, who last season was in charge of Dingli Swallows, will succeed Nicky Saliba as Valletta team manager. Mr Zammit is currently in Gozo to finalise the club's preparations for a training club to be held between June 14 and 18. Mr Sciriha said the club had decided to change the technical staff for next season and inject city blood. He said that the club committee was not to blame for the fact that Valletta did not win the season this year. The reason was the 'farcical' league format which saw Valletta in second place despite having the best record. He also expressed his disappointment over matches which, he said, raised doubts. Mr Zerafa said he was delighted to coach Valletta, which had given him a lot as a player. Mr Sciriha said Valletta intended to engage three or four foreign players and two local ones. Nigerian Omonige Temile, brother of star player Frank, is being lined up to replace winger Priso who is expected to move to a foreign club. A Brazilian striker is expected to join Valletta for trial on Monday. Mr Sciriha said the foreigners would only be handed a permanent deal after the team's participation in the Europa League. He said that striker Michael Mifsud had said he enjoyed playing with Valletta for the past few weeks, but he intended to resume his career abroad. 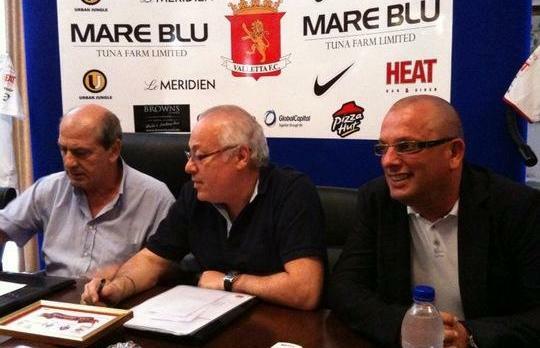 New Valletta coach Jesmond Zerafa (right) with club president Victor Sciriha (left) and vice president Paul Spiteri.